Spain is the focal point of investor anxiety in Europe. NEW YORK (CNNMoney) -- Spain has come under heavy pressure in the bond market this week as investors grow increasingly convinced that the government will need a bailout. At current levels, the price Spain must pay to borrow money for 10 years now looks to be comfortably above 7%, a cost that experts say the government cannot afford to pay for long. The yield on Spain's 10- year bond rose to a high of 7.75% on Wednesday, before falling back to 7.37% later in the day. "The pressures are clearly building for a major policy response, as Spain finds the cost of funding reaching intolerable levels," said Andrew Milligan, head of global strategy at Standard Life Investments in Edinburgh. The surge in yields, which rise when prices fall, reflects a growing conviction among investors that Spain will become the latest, and largest, euro area nation to seek a bailout from the European Union and International Monetary Fund. Spain has been in the line of fire since it requested up to €100 billion in loans from the eurozone rescue fund to recapitalize the nation's banks. Eurozone finance ministers approved the terms of the loan agreement last week, but the move failed to allay concerns about Spain needing a full-blown bailout similar to those given to Greece, Portugal and Ireland. Spanish Prime Minister Mariano Rajoy has resisted taking such a dramatic step, which would entail a significant loss of national sovereignty and a lasting stigma. 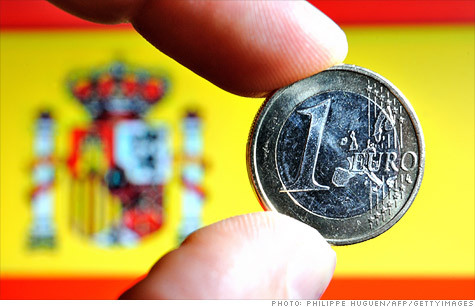 Even if Madrid capitulated, analysts say the eurozone may not have enough money to fund a bailout for Spain. The bulk of Europe's crisis resources will be in the European Stability Mechanism, which is on hold until Sept. 15, when the German Constitutional Court is expected to issue an initial opinion on its legality. What's more, analysts say the ESM will not be able to inject funds directly into Spanish banks until a eurozone-wide banking regulator is established, which could take months, if not years. That means the loans could end up adding to the debts of the Spanish government, which is already struggling to shrink its deficits. In the meantime, eurozone finance ministers have agreed to set aside €30 billion in emergency funds for Spain from the European Financial Stability Facility. By contrast, Spain could need up to €300 billion to cover its financing needs through 2015, according to London-based research firm Capital Economics. The EFSF could theoretically fund a bailout for Spain until the ESM is up and running, said Capital Economics analyst Jonathan Loynes in a research note. But that would deplete the resources of both funds and "leave little in the pot" for other troubled eurozone nations, he added. Indeed, investors have been worried that Italy could be left out in the cold if Spain is forced to take a bailout. The yield on Italy's 10-year bond shot to a high of 6.7% on Wednesday before falling back. The trend in short-term yields is even more worrying, according to Nicholas Spiro, director of London-based consultancy Spiro Sovereign Strategy. In a note, Spiro said yields on Spain's 2-year notes have risen some 85 basis points since last Friday, while Italy's 2-year yields have jumped nearly 100 basis points in the same time frame. A basis point is equal to one one-hundredth of one percentage point. "The failure to shore up Spain is wreaking havoc with Italy's bond market," said Spiro. "Fears that Spain's request for a bailout would make Italy more vulnerable are being borne out." The moves in European bond markets this week have raised speculation that the European Central Bank will intervene on Spain's behalf. The ECB has purchased billions of euros worth of bonds issued by Spain and other euro area governments under the controversial Securities Market Program. The central bank also pumped over €1 trillion worth of liquidity into the European banking system in two separate operations, which temporarily eased sovereign borrowing costs earlier this year. But some ECB officials have expressed concern that subsidizing government debt would reduce the incentive officials have to enact the reforms deemed necessary to restore fiscal discipline. In addition, analysts say another intervention by the ECB would only buy time, rather than address the underlying problems in the eurozone. To do that, euro area leaders need to make a significant move towards a so-called fiscal and political union, analysts say. While they have taken steps in that direction, the shift could take years to complete given the slow pace of progress so far. Much will depend on Germany, the largest economy in the eurozone, which has expressed deep reservations about assuming the liabilities of other euro area governments. "It's very difficult to see what, in the short-term at least, could shore up confidence in Spain and Italy for anything longer than a few weeks or so," said Spiro. "Only a game-changing move on the part of Germany could make a difference. For the time being, this is highly unlikely."